Born and raised in the Rocky Mountains, Karen moved to the Pacific Northwest with her husband and young family in 1977. Karen was very inspired by the beauty of the Northwest. Her work as an artist reflects her love for the natural world, the places that she has traveled both locally and abroad, buildings and wooden boats. Her family spent many weekends and vacations cruising through the San Juan and Gulf Islands. The serenity and breathtaking beauty of these voyages provide a common theme for many of her paintings. Karen’s creative interests have colored her life choices from the time she was small. She has been interested in art and calligraphy since she was a young girl. She majored in Interior Design in her early college years, and received a degree in Graphic Design several years later. Karen worked as a commercial artist for a national fruit and vegetable newspaper, and a draftsman and drafting instructor for an international engineering firm. 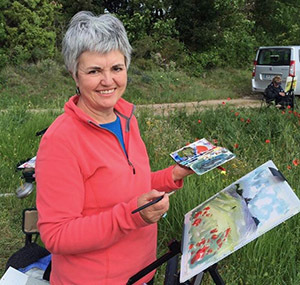 Karen has contributed to local arts and crafts fairs, worked more recently as a graphic designer, and has painted wall murals in an orphanage in Port au Prince, Haiti. She has transitioned from the fine detail work of engineered drawings to the exploration of light, color and texture in her sketches and paintings in watercolor and acrylics. While Karen’s inspiration comes from her travels and the natural world around her, her motivation to create and share her work with others comes from her love for God, the Creator of all, His daily provision and guidance in her life. This is the quiet under-current in each of her works.